Signs and lettering shops can target key demographics and establish projects within the residential market by using this free, printable business plan. Introduction: [COMPANY NAME] was formed in 2006. [NAME] and [NAME] are here to provide the best products and services to their customers and community. In the past four years they have been able to provide products and services to many local businesses and individuals in the area, like race car drivers, excavation businesses, real estate agents, churches, fire departments (for two local towns), tow truck services, and charity events where we donated the vinyl. The Market: In 2009, the U.S. sign industry had shipments of $49.5 billion and employed 262,700 employees. The most recent U.S. Census Bureau data (2006) reported "sign manufacturing" as an $11.7 billion industry. For sign companies and those suppliers selling products and services to sign companies, accurate information on the profile of the industry is crucial to making informed, well-founded decisions about how and where to locate facilities, pursue business opportunities, and develop products to serve new markets. 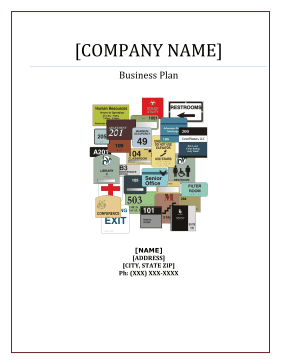 Financial Considerations: The current financial plan for [COMPANY NAME] is to obtain grant funding in the amount of $106,000. The grant funds will be used to expand the signage and Lettering business in the following ways.